Some say that art exists in the tension between extremes, and that the role of the artist is to make sense of that of those tensions. Light and dark. Pleasure and pain. Big and…. tiny? 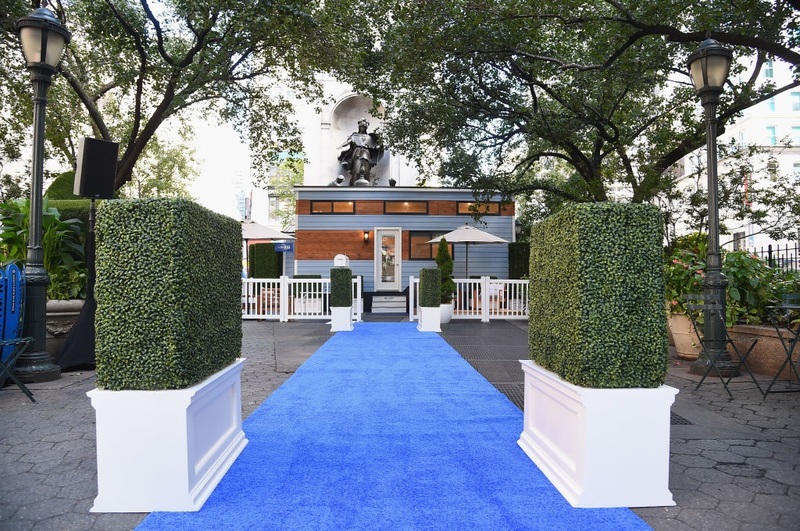 That’s one theme I was confronted by at booking.com’s “Tiny House with Big Personality,” curated by Kevin Hart, a rollout event for a trendy tiny house plopped down in the heart of Manhattan’s Herald Square, as in “remember me to Herald Square.” The idea behind the house is that it’s perfectly situated to his now-iconic stature (i.e. he “doesn’t need a step-ladder to reach the cupboards”) but big enough to fit his high-energy personality. The house isn’t just tailored to Hart’s size, despite the unplayably small ping pong table in the front yard. Framed photos of Hart decorate as many surfaces as possible in such a tiny house, and the shelves are adorned with his complete filmography (with two copies of both Get Hard and The Wedding Ringer) as well as several copies of his book, I Can’t Make This Up. Hart is no doubt having a big year, one that provides a nice counterpoint to this very tiny house. 2017’s Jumanji: Welcome to the Jungle defied literally all expectations and has grossed almost a billion dollars worldwide, meaning that now the only surefire Hollywood tentpoles are the Marvel, Star Wars, and Jumanji cinematic universes. That’s not to mention Night School, his new comedy with Tiffany Haddish and a round of shows at Madison Square Garden, a few avenues away. 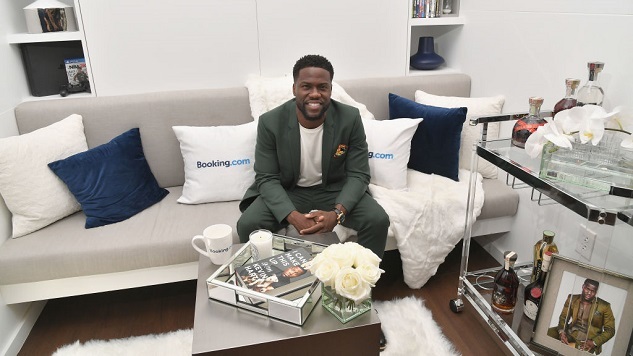 The promotion kicked off when two lucky guests got the chance to stay the night in Kevin Hart’s tiny house while it’s still in New York, before it gets shipped off to Pennsylvania for more bookings (which sold out in less than sixty seconds). Standing outside Kevin Hart’s tiny house, as the blue carpet is swarmed by camera crews and journalists while civilians crowd around the outskirts of the park, literally leaping onto the fence like the gates of the Wonka factory, I am forced to grapple with all kinds of preconceived notions about Kevin Hart, houses, Herald Square, and size itself. Most of the house and yard fits the stated purpose of the whole thing: to have a place that is scaled down until, Goldilocks-style, it’s just right for Kevin Hart. But the massive “Mr. Hart” mailbox and giant green couch fashioned from fake grass beg to differ. People use a large stepladder to hop onto the couch for photo ops. The only person there who draws as big a crowd as Hart does when he steps outside is Freya—a Doberman Pinscher who I am told is famous from her Gucci campaign—when she hops onto the couch for her own photo op. Everyone drops their finger food to take photos of Freya. The “tiny” theme makes me second guess all the little sandwiches and cheese balls they’re passing out. Is this just like any other press event finger food, or is it even… tinier…? Finally, a TV reporter asks Hart the question that’s kept me up at night in advance of the event: “Why a tiny house?” I don’t hear his answer as to why Kevin Hart, specifically, has curated a tiny house that cannot fit all of his entourage at once, leaving at least two of them outside at a time, looking a little lonely. 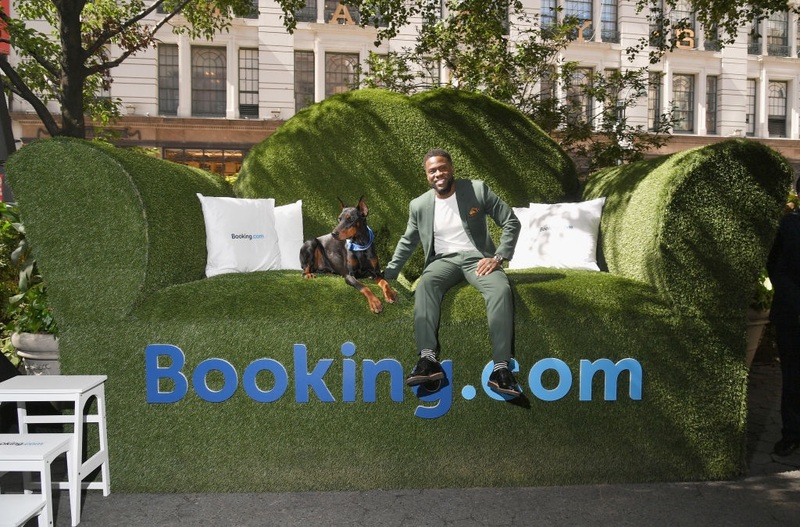 But as for booking.com’s initiative, I assume it falls in line with the rest of the tiny house movement: people are drawn to the tiny house’s promise of self-sufficiency, modesty, a reduced ecological impact, and the possibility of closing the housing gap. Kevin Hart’s 24’ x 8’ tiny house certainly checks a few of those off, and also has a PS4 and a bunch of his favorite liquor. The house’s lofted bedroom does indeed look cozy, and the tiny kitchenette with mini stovetops gives off a more polished impression that this would satisfy someone’s Lost in America fantasy of a scaled down life. I want to map that psychology onto Kevin Hart himself—certainly the idea that tiny houses represent an equal and opposite reaction against the American ideal of wanting more and more and more could apply to one’s rapidly growing celebrity as well. But that isn’t for me to say. Kevin Hart steps out of his tiny house and poses by his not-tiny mailbox. He asks the surrounding photographers if they’re ready for the “epic mailbox shot.” They are. Everyone crowds around Kevin Hart as he reaches into the large mailbox, pausing to allow everyone to take pictures of this moment. There is, and I’m not kidding, genuine tension in the air. What is going to happen? I don’t know. I’m still getting used to the idea of Kevin Hart’s tiny house. Kevin Hart removes his hand from the mailbox and produces a handful of letters, but: they’re huge. They’re so big. My equilibrium is thrown off again. With that, Kevin Hart is off. Everyone looks around, some still munching on finger food. One photographer turns to a woman and asks if she speaks Portuguese. She shakes her head. He curses under his breath. “I need to find someone who speaks Portuguese.” Indeed, we’re all a little lost without Kevin Hart. But honestly, the idea of staying at this house in Pennsylvania sounds lovely. The idea of staying here in Herald Square overnight, however, presumably surrounded by security, sounds like a nightmare, though a nightmare with unprecedented door-to-door access to a Sunglass Hut. I am given comfort, though, right outside the window of Kevin Hart’s tiny house, where you can see the Herald Square monument to James Gordon Bennett, founder of the New York Herald. Atop the monument towers an imposing statue of the Goddess Athena, daughter of Zeus (the original big personality), who will look over Kevin Hart’s tiny house and all who dwell there, shielding them under the aegis from any harm that might befall them.